Are Stocks Really Better than Bonds? A widely held belief among investors is that over time, equities will do better than bonds. While I believed this to be true, I thought it would be interesting to test this. I was particularly interested in what happened if someone were unlucky enough to have invested all of their money in stocks near the peaks prior to the two major bear markets experienced in the past 30 years. 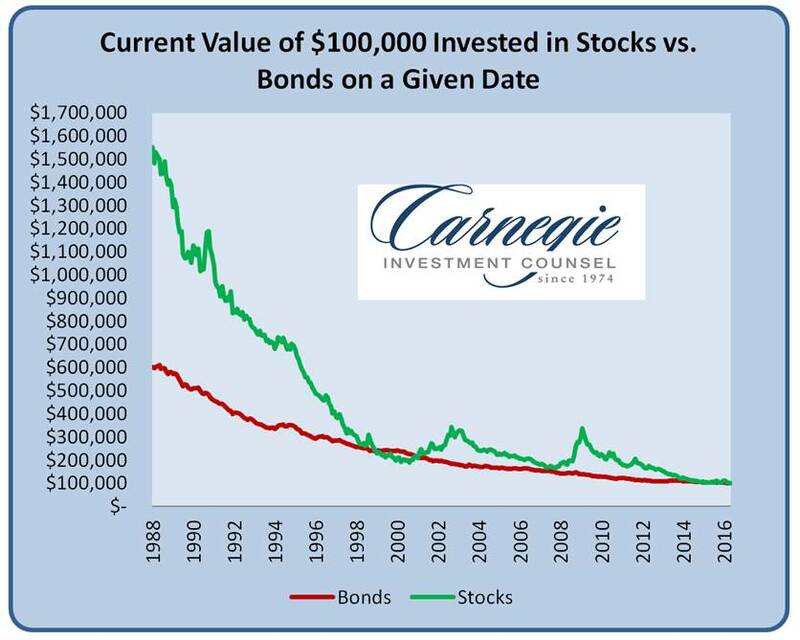 The chart below shows the current value of $100,000 invested in stocks and bonds on a given date in the past. To clarify, if one had invested $100,000 in stocks in 1988, he/she would currently have around $1,600,000. Investing the same amount in bonds would have resulted in a current value of $600,000.